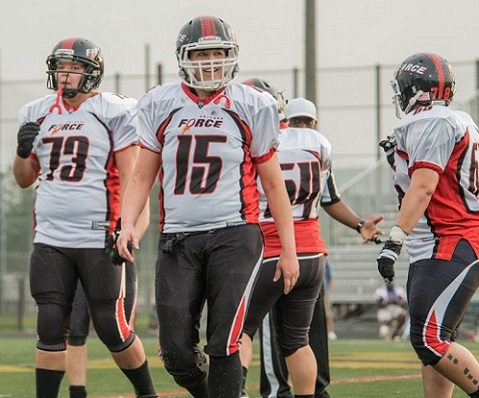 SPRINGFIELD, VA: The Chicago Force claimed a 28-21 victory over the two-time defending champion DC Divas by scoring the go ahead touchdown in the final minute of play. Chicago running back Kristy Moran knifed through the Diva defense and scooted into the corner of the end zone for the winning score with 0:55 seconds remaining in the game, silencing the Divas home crowd. Chicago received the opening kickoff and attained great field position at the DC 32 yard line on a nice return from Cassey Brick. The offense moved steadily and easily, scoring on a 10 yard pass completion to Emma Vanderheyden. But a bad snap on the PAT prevented a kick so Chicago led 6-0 just two minutes into the game. It was the shortest of leads however, as the Diva kick returner received the Force kickoff and followed her blocks and a gaping hole all the way to the end zone. A successful PAT put the Divas ahead 7-6. Chicago started their next possession on their own 42 yard line and again the offense was moving freely, but a well thrown pass was batted upwards by the receiver and intercepted by DC. After a turnover on downs Chicago started again this time on their own 29 yard line and quickly began to drive the field. A huge 36 yard run by Kelsey Casey put the ball on the five yard line. Casey ran it in from there on the following play and then also punched in the two point conversion to put Chicago in the lead again 14-7. On DC's next possession their running back fumbled and Kim Marks recovered the ball at the Diva 29 yard line. Quarterback Sami Grisafe connected with JJ Javelet on the first play for a touchdown pass. Jules Harshbarger kicked the extra point for a 21-7 lead with two minutes remaining in the first quarter and it appeared that Chicago might run away with this game as their offense was unstoppable. But DC Started their next possession near midfield and began a scoring drive that was aided by two consecutive pass interference penalties. DC then scored on a 12 yard TD pass and converted the extra point to narrow the gap to 21-14. Chicago's next possession was killed on the second play when yet another receiver misplayed a well thrown pass and it ended up in the hands of a DC defender. Neither team was able to score on their next possessions so Chicago took the 21-14 lead into halftime. Most of the second half was more of the same for Chicago – missed opportunities on offense and their defense allowing too many late down conversions. The Force missed out on another score when they failed to reach the end zone in four attempts inside the 10 yard line, turning the ball over on downs. DC then had a time-consuming 99 yard march down the field, converting several 3rd and 4th down attempts before connecting on a 13 yard TD pass to tie the game at 21-21 with 5:28 left in the 4th quarter. All game Grisafe had been throwing extremely well but her receiving corps had a bad case of the dropsies. Chicago's next possession ended prematurely when a catchable 3rd down pass for a long gain was dropped. This forced a punt that Harshbarger boomed down to the DC 23 yard line. On 3rd down, DC threw an errant pass that was intercepted by Chicago safety Carolyn Lee with 2:32 left in the game. Chicago started from the DC 37 yard line. Moran ran the ball on three of the next four plays and finished the drive with a 17 yard burst into the end zone. Harshbarger drilled the PAT through the uprights for 28-21 lead with 0:55 seconds remaining. Harshbarger further helped the Chicago cause by burying the DC returner with a deep kick and forcing the Divas to start from their own 15 yard line with 49 seconds remaining. DC picked up a first down on a nice sideline completion. On the final two plays of regulation Kelly Washington flushed their quarterback out of the pocket, allowing Tamika Robinson to first sack her for a loss, and then tackle her near the sideline on the ensuing final play as time ran out. 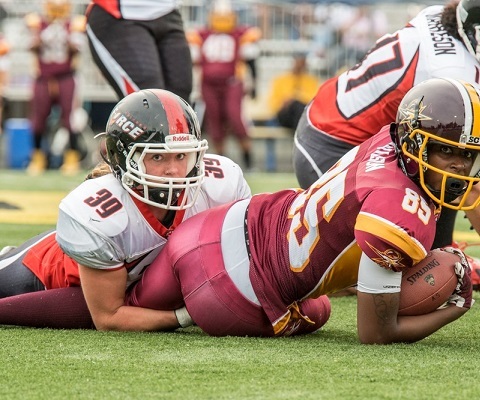 Chicago's defense was led by linebacker Emilie Belanger who was all over the field with 11 tackles and a sack. Additional support came from Kelsey Casey and Sonja Drangsholt with 7 tackles each. Marks had 6 tackles, 2 sacks and a fumble recovery. And Angel Smith had 4 tackles, 3 tackles for a loss and 2 quarterback knockdowns. Kristy Moran had a solid game with 19 carries for 106 yards and the game winning score in crunch time. Kelsey Casey had 9 carries for 77 yards and a touchdown. JJ Javelet had 4 receptions for 91 yards and a touchdown, and Cassey Brick had 3 receptions for 75 yards. Chicago will have an extended home stand in May and June, with the home opener on May 6th vs the undefeated Minnesota Vixen. 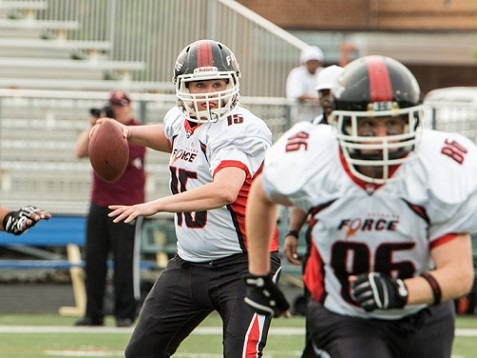 Force home games are played at Evanston Township High School with 6pm kickoffs.